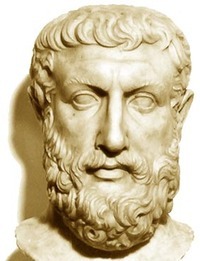 Parmenides of Elea (greek: Παρμενίδης)was an ancient Greek philosopher born in Elea, a Greek city on the southern coast of Italy. He was the founder of the Eleatic school of philosophy. Parmenides was also a priest of Apollo and iatromantis. The single known work of Parmenides is a poem which has survived only in fragmentary form. In this poem, Parmenides describes two views of reality. In The Way of Truth (a part of the poem), he explains how reality is one, change is impossible, and existence is timeless, uniform, and unchanging. In The Way of Opinion, he explains the world of appearances, which is false and deceitful. These thoughts strongly influenced Plato, and through him, the whole of western philosophy. Is this you? Let us know. If not, help out and invite Parmenides to Goodreads.